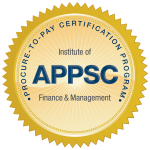 The Procure-to-Pay Solution Consultant Certificate Program (APPSC) is designed to equip vendors with the understanding of what procurement and payables leaders and their staff considering when implementing procure-to-pay processes, including thinking end-to-end, analyzing and redesigning their current processes, and supporting their organization’s evolution towards P2P. This program includes the e-textbook, video recording of a full-day training, practice quiz and three attempts at the final exam. Enrollment expires one year from date of purchase.